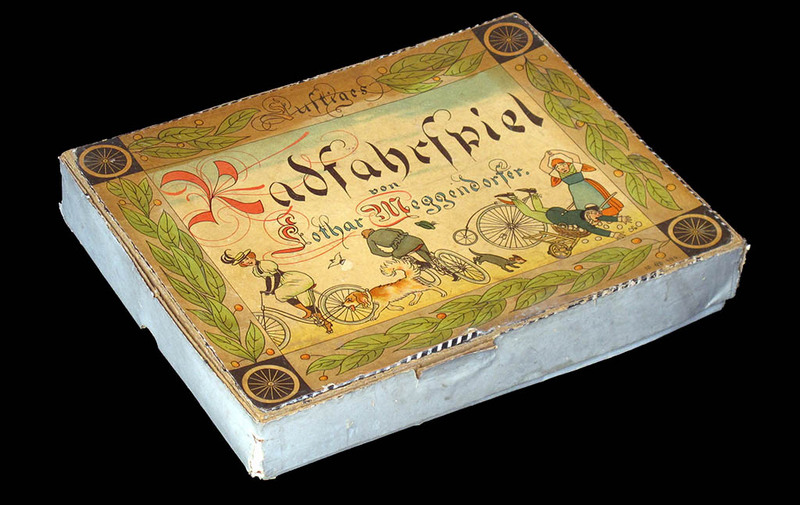 This a gorgeous turn-of-the-century game by famous German illustrator Lothar Meggendorfer. 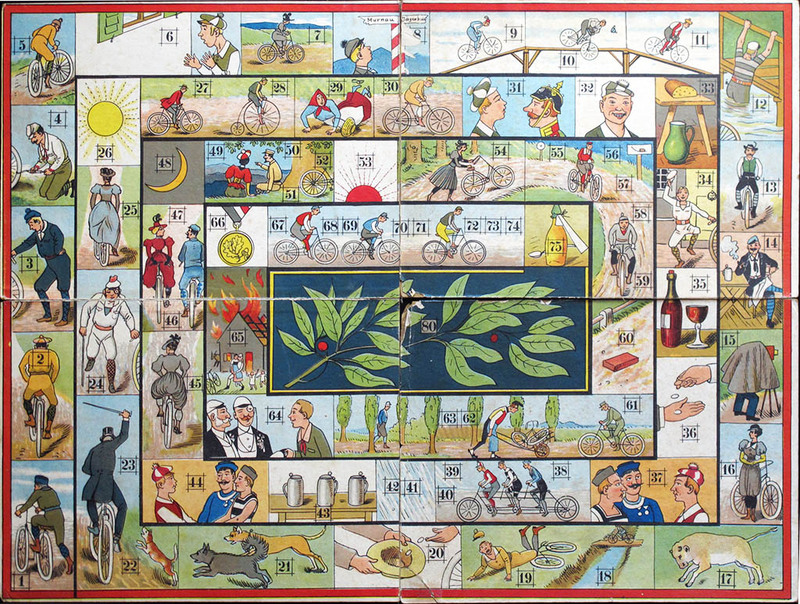 Of course Meggendorfer (1847-1925) is better known for his pop-up books, but he also illustrated a number of games among which we find this cycling game. Dating this kind of games is always tricky since we have little reliable information. We know that Meggendorfer was already famous when this game was made since his name is displayed quite prominently on the box, but that does not help much, since Meggendorfer was famous since he was quite young. The box measures 36 x 28 x 5 cms and the open board measures 61 x 47 cms. Unfortunately I do not have the rules of the game, but I guess it is safe to put in the games-of-goose category. 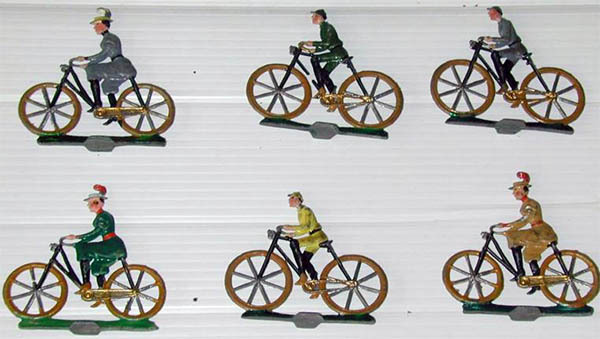 By the way the cyclists are dressed and by the presence of big-wheel velocipedes, my guess is that the game was made sometimes in the 1890s. 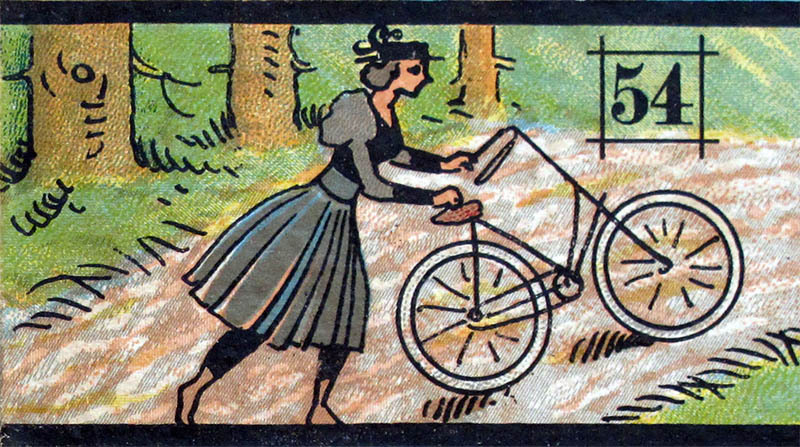 Cycling was more important than we generally remember for building a feminist revolution in the 1890s. 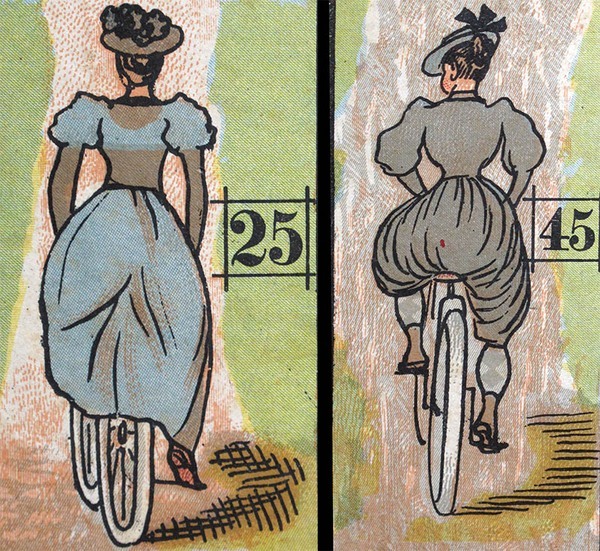 The Victorian dress was quite impractical for riding a bike and as early as 1881 the Rational Dress Society was formed in London, and the first Lady Cyclists' Association (also English) dates from 1892. German women were not too far behind the British in their reivindications. Pneumatic tyres were invented by John Dunlop in 1887. 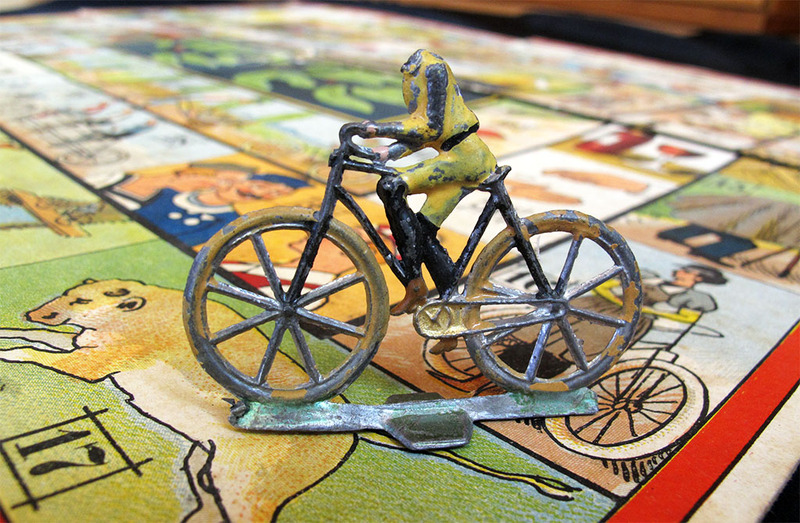 They spread rapidly in the cycling world and were one of the main factors that ushered the bicycle craze of the 1890s. 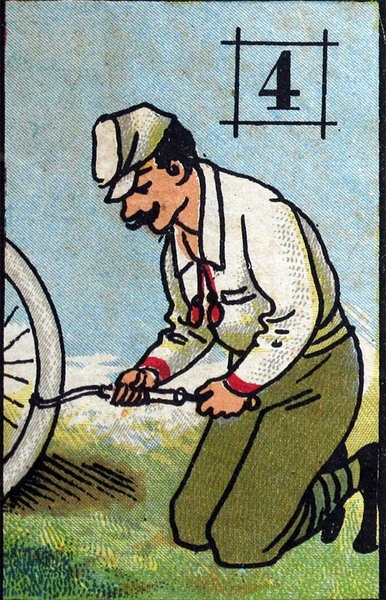 Of course, punctures also date from this time. Falls, on the other hand, have always been there. There should be 6 figurines in the box, three male and three female (see below). Unfortunately I only have one. 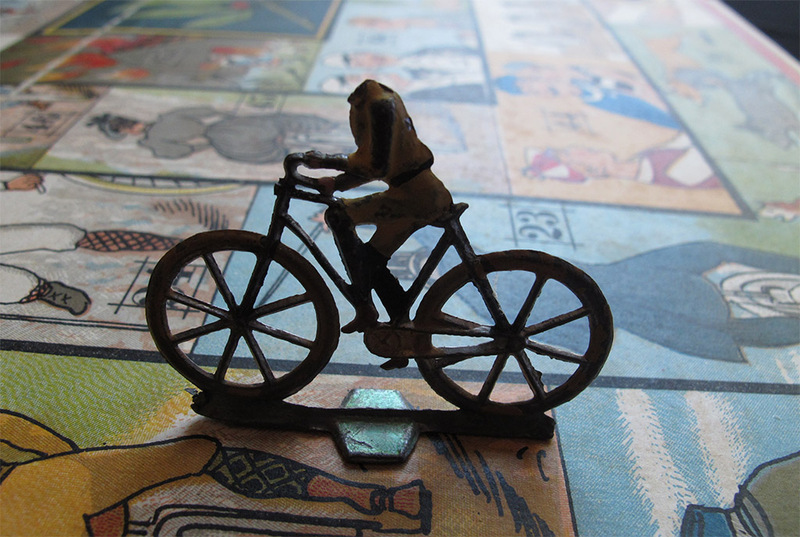 It measures 5.5 cms and, apart from the fact that it is beheaded (as is not unusual in old metal riders) one can appreciate some details in the bike which are consistent with the game being from the XIXth century.